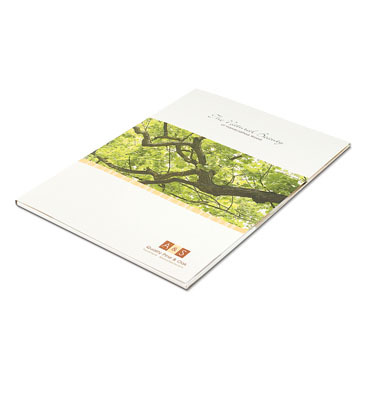 Folders are very popular as an alternative to the wire stitched brochure with fixed pages. Where organisations submit quotations or proposals to their clients, with product leaflets, a well designed and printed folder adds style and impact. Because the corporate folder can be used for a variety of functions the design and content is usually limited to an overview of the organisation. Specific product details which may quickly become outdated are printed on separate leaflets. To accomodate A4 sized inserts folders should be A3 +5mm approx, various pocket shapes and styles are available eg made up complete, with glued pockets, flat packed, unglued for self assembly, with or without a gusset for extra capacity.